Few would disagree that the Himalayan mountain regions of Nepal contain some of the best places in the world to go trekking. Largely inaccessible by road, combined with the well-worn foot tracks developed between villages over centuries, makes trekking the best way of seeing the Himalaya. Choose from treks like Everest Base Camp & Gokyo Lakes, Annapurna or Langtang to less popular trekking options including Mustang or Kanchenjunga Base Camp. 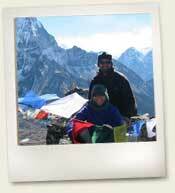 From short, easy treks to month long expeditions, from tea-house trekking to camping 'rough', Nepal has it all. Whatever your trekking interest Adventure Alpine Gorkha Treks and Expeditions can help you have the time of your life trekking in Nepal. Take a look at our featured treks, articles with tips on preparing to go trekking, view frequently asked questions or make a trekking enquiry.